Earlier this month, the Bloomingdale Trail, aka The 606, grabbed the spotlight as our city’s latest fabulous public space. 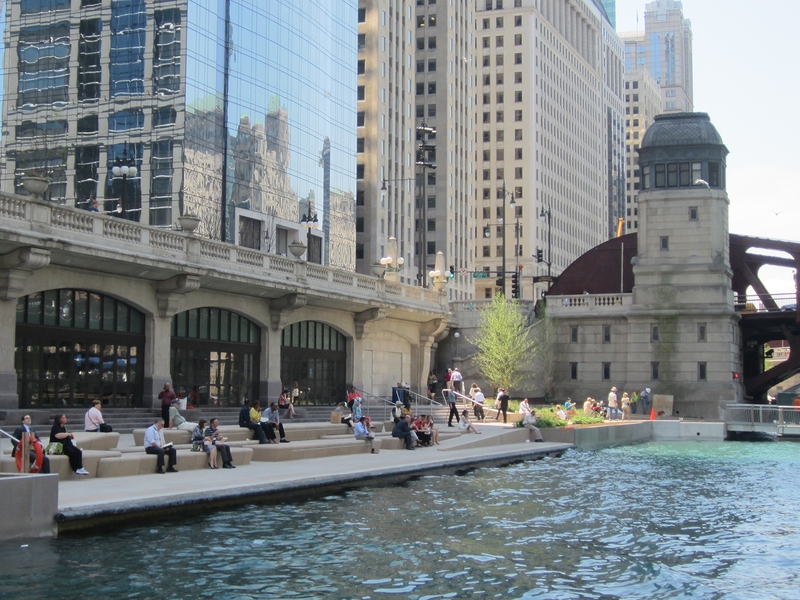 However, the Chicago Riverwalk extension, which partially opened on May 23, is another strong contender. The new two-block stretch between State and Clark takes you down to within a foot or two of the sea-green water, and there are unique, breathtaking views of the city as you round the bridge houses. The roughly $100 million project, funded by a federal Transportation Infrastructure Finance Innovation Act Loan that needs to be paid back in about thirty-five years, is slated to be extended all the way to Lake and Wacker by 2016. The now-open sections are the Cove, which has stone-like concrete seating units and will feature kayak rentals, and the Marina, with elegant teakwood banquettes whose tops will double as bar seating for eating and drinking establishments. Upcoming amenities include amphitheater seating, a water play area, fishing piers and a boardwalk. The new spaces are already a hit with Chicagoans from all walks of life, and you’ll see dozens of people strolling, lunching, catching carp and relaxing there on nice days. The one fly in the ointment is that, while the riverwalk extension was designed to be a transportation corridor, it doesn’t function particularly well as one. Narrow sections of the path create bottlenecks, and sharp turns in the route are tricky to navigate, making it difficult to walk—let alone bike—the route efficiently when it’s crowded. Gina Ford, a landscape architect at Sasaki Associates, which helped plan the riverwalk, offered to discuss the reasoning behind the design. The Riverwalk’s been getting rave reviews overall, but please tell me what you guys had in mind with the routing for pedestrians and cyclists. One of the challenges that we had to deal with on the riverwalk was how to accommodate what we felt should be included in a really small space. Part of that has to do with the fact that the [landfill to extend the riverbank] required a permit, and it took many years and an act of Congress to permit it. The dimensions of our buildout zone were very fixed in order to maintain safe harbor on the river and making sure that barge traffic has the right clearances. We were really limited with the underbridge connections, where you have a twenty-foot offset [the maximum amount of land that could be built out from the existing shoreline] and a twenty-five-foot offset in each “room” of the riverwalk. So part of the right-angle turn critique we agree with. It would have been lovely if there was a much broader space, but there were other factors that determined that boundary and that shape. As a design response, we did a couple of really subtle things. Rather than making most of the turns exactly ninety degrees, most of them are slightly more obtuse of an angle. If you look at the inside corners of the Cove, and the inside and outside corners of the Marina, both of those have slightly bigger angles than ninety degrees. We also set a best-practice dimension of a ten-foot minimum walkway. But you’re correct: It is very tight. Did you guys consider making the seating areas a little smaller in order to make the path wider? We looked at a lot of different options at the beginning. The idea was not just to make it a place to pass through but also a place where different programs could happen. So we were trying to find the right balance of the mobility needs of the space but also the desire to have space to tie up boats. That was part of the driver of the project, having more interaction with kayaks and boats and water taxis. The project is financed by a TIFIA loan, a loan for transportation infrastructure. Do you think that’s appropriate in terms of what we got—does this qualify as a transportation corridor? If you look at cities across the country and you look at the park systems and what their goals are, the great majority of cities are looking for more alternative transportation options and walkable urban centers. The fact that people will be able to walk [from the West Loop] all the way out to the lake without having to cross a street is a pretty significant investment in mobility and better access to park space and open space. Also, the TIFIA loan has to be paid back, so there needs to be revenue generation within the riverwalk. The boats help with that, the vendors and the dining terrace help with that. So there was a lot of balancing that the design needed to do in order to make sure it was meeting a large set of needs. What’s the most exciting thing about the project from your perspective? The idea that people are reconnecting with this river in a really powerful way is exciting. We’ve seen a lot of that. There was a piece by Aaron Rose in Newcity last week where she talked about getting lost in the river and kind of forgetting that you’re in the downtown for a moment, and really connecting with a different aspect of Chicago. Once the riverwalk connects all the way to Lake Street, that will be a truly magnificent new experience for the city.